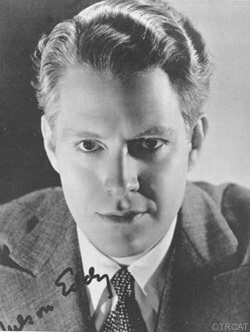 "The Electric Hour has spark," and Nelson Eddy was the flame; hear him sing many rare recordings in this half hour musical variety show from the 1940s. "The Electric Hour has spark," and Nelson Eddy was the flame. The Electric Hour with Nelson Eddy debuted in 1942, featuring Eddy's musical performances and lively personality. The fair haired singer with the smooth baritone voice was already a star, famous for his box office success in Hollywood, and his decades of radio work, opera, and concerts. The Electric Hour was a weekly, half hour musical variety show broadcast on CBS, and sponsored by electric companies. Audiences could enjoy Eddy's wide range as he performed selections from opera, folk, popular, gospel, duets and songs from his movie. Sparkling with Eddy's friendly banter and warm humor, and graced with guest stars, including his famous on-screen sweetheart, Jeanette MacDonald, the show had a devoted -- and mostly female -- following. 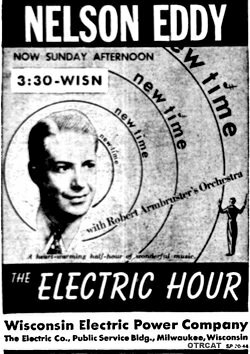 Nelson Eddy logged over 600 radio appearances during his career (including a stint on Kraft Music Hall), but The Electric Hour is a standout among them. Many of the songs performed on The Electric Hour were never commercially recorded, and are only available on this program. Be the first to comment on "Nelson Eddy Electric Hour"